White paper on crime 2001 Part 2/Chap.3/Sec.2/2. Viewing the number of defendants finally disposed in the first instance by district, family and summary courts by type of proceedings, 72,468 (6.6% of the total) were disposed by ordinary proceedings and 1,024,172 (93.4%) were by summary proceedings in 1999. 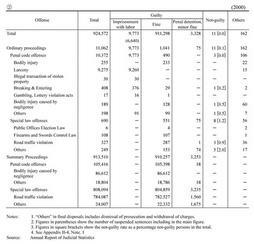 In 2000, 78,450 (7.9% of the total) were disposed by ordinary proceedings and 913,510 (92.1%) were by summary proceedings. Thus, an overwhelming majority of defendants were disposed by summary proceedings. 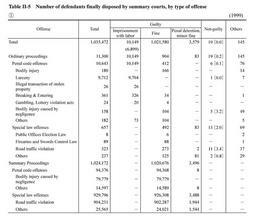 Table II-4 shows the number of defendants finally disposed in the first instance by district and family courts in 1999 and 2000, by type of offense and type of final disposal. The number of defendants finally disposed by district courts increased by 3,400 (5.9%) from the previous year to 60,923 in 1999, and further increased in 2000 by 6,238 (10.2%) to 67,161. By type of offense, most defendants were disposed for Stimulant Drug Control Law violations both in 1999 and 2000 (22.3% of the total in 2000), followed by road traffic violations (15.2%), larceny (11.9%), and bodily injury caused by negligence (9.0%), in that order. The number of defendants finally disposed in the first instance by family courts for adult criminal cases against the welfare of juveniles decreased by 18 (7.3%) from the previous year to 227 in 2000. 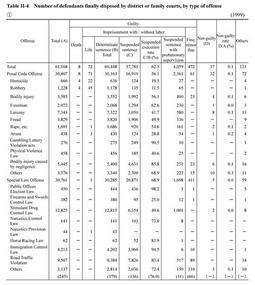 Among the 54 defendants who were sentenced to fines or minor fines, 34 (63.0%) were for Child Welfare Law violations and 20 (37.0%) for Labor Standards Law violations. Most of those sentenced to imprisonment with labor in 1999 and 2000 were for Child Welfare Law violations (98.3% in 1999 and 98.8% in 2000). Table II-5 shows the number of defendants finally disposed in the first instance by summary courts in 1999 and 2000, by type of offense and type of final disposal. The number of defendants finally disposed by summary courts by ordinary proceedings increased by 984 (9.5%) from the previous year to 11,300 in 1999, but then decreased by 238 (2.1%) to 11,062 in 2000. 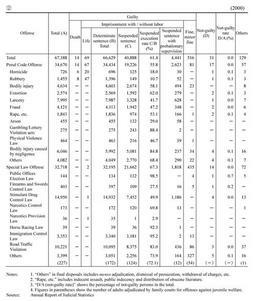 Both in 1999 and 2000, most of the defendants sentenced to imprisonment with labor (95.6% in 1999 and 94.8% in 2000) were for larceny and about 50% of the defendants sentenced to fines (48.6% in 1999 and 50.0% in 2000) were for bodily injury and road traffic violations. The number of defendants sentenced to fines or minor fines by summary proceedings increased by 5,698 from the previous year to 1,024,172 in 1999, but then decreased by 110,662 (10.8%) to 913,510 in 2000. By type of offense, most of these defendants were sentenced for road traffic violations both in 1999 and 2000 (85.8% of the total defendants disposed by summary proceedings in 2000).